Nik Nanos digs beneath the numbers with CBC Power & Politics host Evan Solomon to get to the political, economic and social forces that shape our lives. This week: Which anniversaries do Canadians encourage the government to celebrate? Nik Nanos digs beneath the numbers with CBC News Network Power & Politics host Evan Solomon to get at the political, economic and social forces that shape our lives. 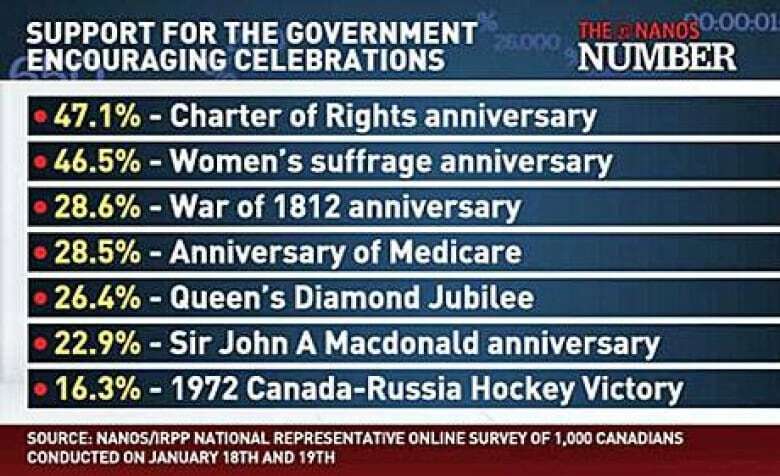 This week: Which anniversaries do Canadians encourage the government to celebrate? The percentage of Canadians who felt more patriotic as a result of the celebrations of the War of 1812 anniversary. Source: Nanos/IRPP national representative online survey of 1,000 Canadians conducted on January 18th & 19th. A new survey by Nanos Research along with the Institute for Research on Public Policy and Policy Options magazine reveals more Canadians would encourage the government to celebrate the anniversary of the Charter of Rights and Freedoms or women's suffrage than the anniversary of the War of 1812, the Queen's Diamond Jubilee or the birthday of Sir John A. Macdonald. The findings are based on a representative random online survey of adult Canadians conducted Jan. 18 and 19, 2013. A margin of error does not apply and the data was weighted using the latest Census information to be a true representation of opinion at the time of the fieldwork. Respondents were asked whether they supported, somewhat supported, opposed or somewhat opposed the government encouraging celebrations on a list of landmark anniversaries, including some the government has spent millions of dollars on recently. "What's interesting is that things that affect the day-to-day lives of Canadians, such as the Charter, such as women getting the vote, are actually more likely to have a higher intensity of support," Nik Nanos told Solomon on Power & Politics Wednesday. Celebrations around the 200th anniversary of the War of 1812 cost the government $28 million, but were not at the top of the list for Canadians, according to the Nanos/IRPP survey. 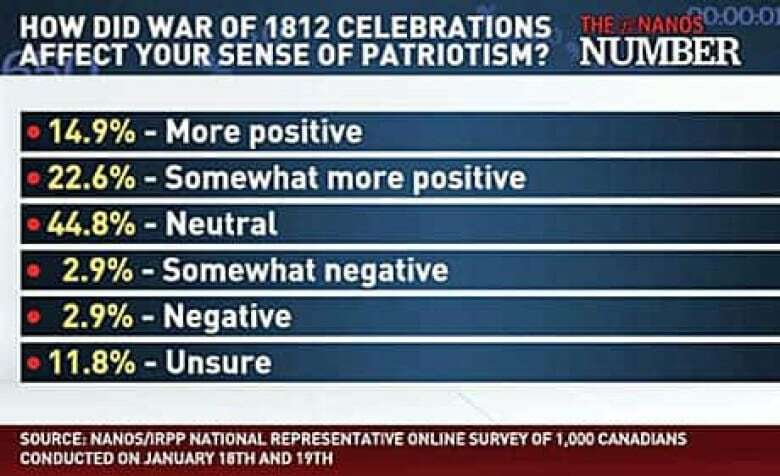 When respondents were asked whether celebrations surrounding the 1812 anniversary affected their sense of patriotism, the majority of respondents, 44 per cent, were neutral. Only 15 per cent said it had a more positive affect on their patriotism, suggesting the 1812 anniversary celebrations did not produce a "patriotic boost," Nanos said. Those celebrations are part of a broader narrative that the Conservatives are trying to advance, Nanos added. With a focus on the Commonwealth, the restoration of the Queen's portrait at the Department of Foreign Affairs headquarters and the royal re-naming of the navy and the air force, "it's retro-hour in Stephen Harper's world, and he wants to build those traditions in order to advance a particular view of Canada," Nanos said. But that might not be in line with what the majority of Canadians are thinking. This becomes even more true when the regional breakdowns are considered. The War of 1812 celebrations had some traction in Ontario, but did not resonate in Quebec or out West, Nanos points out. "This poll shows the majority of Canadians are more likely to look at contemporary things to celebrate, such as the Charter of Rights and Freedoms," Nanos said, suggesting the government should consider including more recent events in its celebration plans. Recognized as one of Canada's top research experts, Nik Nanos provides numbers-driven counsel to senior executives and major organizations. He leads the analyst team at Nanos, is a fellow of the Marketing Research and Intelligence Association, a research associate professor with SUNY (Buffalo) and a 2013 public policy scholar with the Woodrow Wilson International Center for Scholars in Washington DC.